Do you know that individuals with diabetes are at risk for serious foot problems? Proper footwear is essential for patients with diabetes. Diabetic patients can develop sores and infections that later can result in infections and amputations if shoes are not fitted or selected properly. 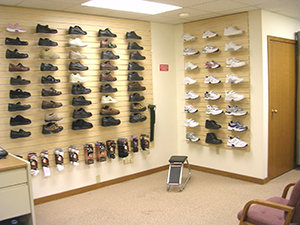 Our office can provide you with a wide variety of stylish shoes. Our complete line of shoes provide the extra depth and design considerations necessary to prevent diabetic foot complication as well as providing comfort and style. If you are interested in a quality pair of diabetic shoes with custom fabricated or direct molded inserts be sure to speak with our staff, they are trained to size, fit and help select the perfect shoe for you. Medicare recognizes the importance of wearing proper footwear for diabetic patients. They have developed the Medicare Therapeutic Shoe Program covering 80% of diabetic footwear and inserts. Please read the following details about this program by clicking here. If you have additional questions please contact the office. We take pride in the ability to offer a wide range of shoes to fit any style. Please see the list of brands we currently carry. We also have diabetic socks and compression socks available for purchase.